SACRAMENTO, CA — The California Chamber of Commerce today added SB 993 (Hertzberg) to its job killer list, bringing the total number of job killers to 28. The latest bill will be considered as a special order of business in the Senate Governance and Finance Committee on May 16. SB 993 (Hertzberg; D-Van Nuys) would impose a 3% tax on services purchased by businesses in California. CalChamber has identified SB 993 as a job killer because it adds another layer of taxes onto California companies, raising costs, and puts them at a competitive disadvantage. 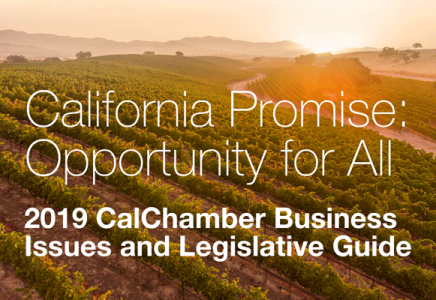 According to CalChamber’s analysis, SB 993 would increase the cost of doing business in an already costly state by taxing most of the services used by businesses, including those necessary for day-to-day operations, like accounting or janitorial services. Additionally, SB 993 would make an already complex tax system even more costly and challenging for California businesses to navigate. The negative impacts of SB 993 will hit small businesses the hardest. Although the bill has a limited exemption from this tax increase for certain small businesses, it certainly does not protect all of them. Small businesses depend on the services included under SB 993 to conduct their operations. While larger businesses will be able to avoid paying taxes on certain services by bringing them in-house, most small businesses will not be able to do so. The burden of complying with this new tax will also be more challenging for small businesses that provide services – as they likely have limited resources to set up a new tax system within their companies. Additionally, such small businesses could suffer a loss of customers and revenue due to higher prices for their services. Even though SB 993 focuses on business-to-business transactions, and attempts to avoid raising taxes on individuals – this bill would increase the costs of producing and selling goods here in California. These costs would ultimately be passed on to consumers – with the higher prices disproportionately impacting working families, CalChamber’s letter states. SB 993 will be heard in the Senate Governance and Finance Committee on May 16. Only 22 job killer bills remain alive; To view the job killer list, visit www.cajobkillers.com. For up-to-date information on the job killer list, follow @CAJobKillers on Twitter.